The Tories have just set another significant economic record, ans it's not a good one. 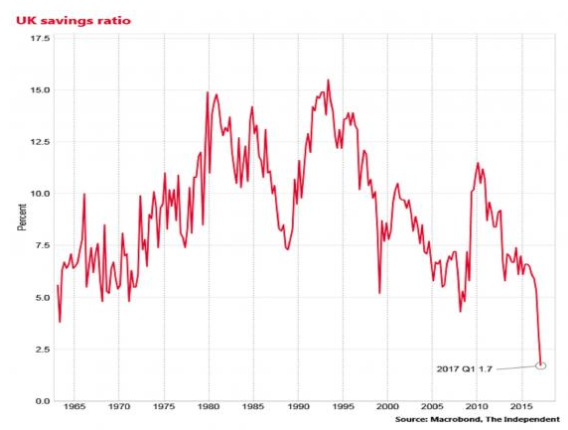 The UK savings rate has plunged to an all-time record low of just 1.7% of GDP. Despite the fact that the Tories have repeatedly set all kinds of terrible economic records over the last seven years of economic mismanagement, there are millions of people out there who believe they're doing a good job of managing the economy! Since 2010 the Tories have created more new debt than every Labour government in history combined. Between 2010 and 2017 the Tories oversaw the lowest level of house building since the early 1920s. Tory wage repression policies resulted in the worst collapse in the value of workers' wages since records began. Tory wage repression created a situation where the UK is the only economy in the developed world where the economy was growing while the share of the wealth going to workers was actually shrinking (meaning British workers are getting the worst deal in the world). Low levels of house building at a time of soaring demand combined with the ongoing Tory wage slump mean that UK house prices rose to their most unaffordable level ever in March 2017. Hard-right Tory austerity dogma resulted in the slowest post-crisis economic recovery since the early 18th Century. The Tories have broken the trade deficit record over and again since 2010. Since 2010 the UK economy has slumped into an appalling productivity crisis as the output of British workers has slumped dramatically in comparison to other major economies. Since the Brexit vote the Tories have overseen the worst collapse in disposable income since the 1970s. And now they've overseen a collapse to the lowest savings rate since records began. The Tory economic narrative is astoundingly incoherent. They argue that Britain is too poor to be able to afford decent public services or fair wages for the heroic grenfell tower fire fighters. but they also argue that they're doing such a fantastic job of managing the economy! Just imagine the immunity to cognitive dissonance that is necessary for Tories to switch repeatedly between claiming that Britain is broke and Britain is booming, often in the same damned statement. And just imagine the economic naivety of the people who actually believe both of these mutually contradictory Tory propaganda narratives. I'm not sure that it should be necessary to explain why savings are important, or that an all-time record low in the savings rate is a sign of extreme economic weakness, but levels of economic education are obviously incredibly poor if millions of people are prepared to buy into the Tory propaganda narrative that Britain is both booming and broke at the same time, so I'll explain the importance of savings very briefly and simply. Savings are important because they create economic flexibility and resilience. People with savings have the ability to invest in new innovative businesses, and they have the means to support themselves if they fall on hard times. The lower the savings rate, the fewer opportunities people have to invest in the innovative businesses of the future, and the more reliant they are on the social security system if they encounter economic difficulties. A collapsed savings rate is an indicator that huge numbers of people are struggling to get by so badly that they simply can't afford to set anything aside for future investments, or for a rainy day, and that millions more are struggling so badly that they're actively eating into their savings in order to keep their heads above water (they're having their rainy day right now). 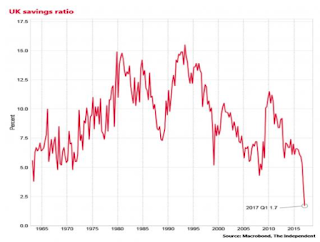 Any sane analysis would present this savings rate collapse as an indicator of extreme economic sickness, but the mainstream media are already trying to cast the blame onto anything but the Tories and their toxic austerity dogma. Sky News is even trying to claim that the problem is caused by some kind of "reckless thirst for spending" amongst the British public. They're presenting the problem as if seven years of catastrophic Tory economic mismanagement has nothing to do with it, and that some kind of radical, unprecedented and unexplained post-Brexit psychological shift has turned the British public into a bunch of hopelessly reckless spendthrifts within the space of a year! Mainstream media outlets are far more likely to actually repeat the lunatic assumptions of "let's cut our way to growth" Tory austerity dogma as if they're unquestionable facts, than they are to point out how austerity dogma is a root cause of the litany of economic failure detailed above. Mainstream media journalists are extraordinarily reluctant to point out the jarring disconnect between the mutually contradictory Tory propaganda narratives that Britain is both completely broke and absolutely booming. 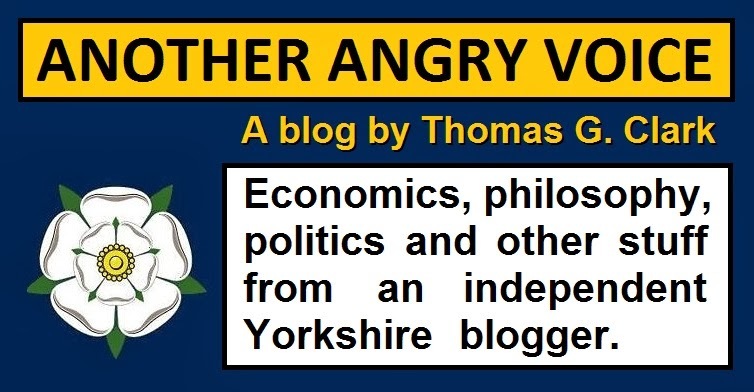 Most mainstream media journalists are far more likely to blame the public, or the EU, or immigrants, or the opposition parties for the Tories' economic failings, rather than point out the role of fanatical Tory austerity dogma in retarding the UK economy. The bulk of the mainstream media are unwilling to hold the Tories to account because an astonishing percentage of them went to the same elitist private schools, and the same exclusive universities as the Tories. Just 7% of British people were educated at fee-paying private schools, but 51% of mainstream media journalists went to these exclusive schools, which is an even higher percentage than back in the 1980s. The majority of mainstream media journalists don't give a damn that the Tories are screwing the economy and condemning millions to poverty because it doesn't directly affect them in their comfortable bubbles of privilege. Their big houses in the country, flashy cars, expensive designer products and ostentatious luxury holidays depend heavily on them not rocking the boat. They're happy for the rest of us to suffer the burdens of austerity that they'll refuse to condemn it as the fanatical hard-right economic vandalism that it is. They're actually happy to see other people suffer the deprivations of austerity, and see the UK get left behind in the global economic race due to chronic under-investment in infrastructure, innovation and services. They're happy to collude with this ruinous hard-right Tory agenda because they're actually doing alright out of it thanks very much. Austerity and national economic decline are absolutely fine by them as long as it's other people who are forced to carry the cost of it. 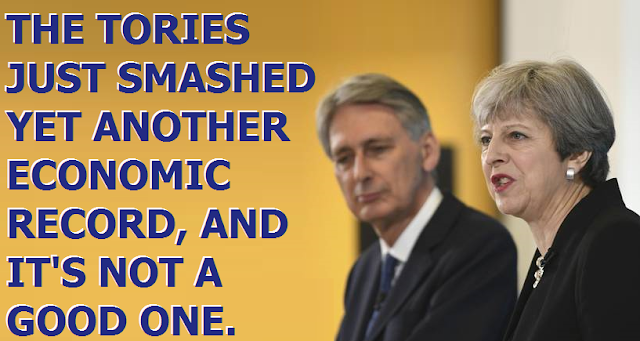 Don't expect the Tories or their enablers in the mainstream media to suddenly begin telling you the truth about the economy, and the way that radical hard-right Tory austerity dogma has been wrecking it. Jameel Muhktar and his 21 year old cousin Resham Khan suffered severe life-changing injuries when acid was squirted through their car window in Beckton on Wednesday 21st June 2017. 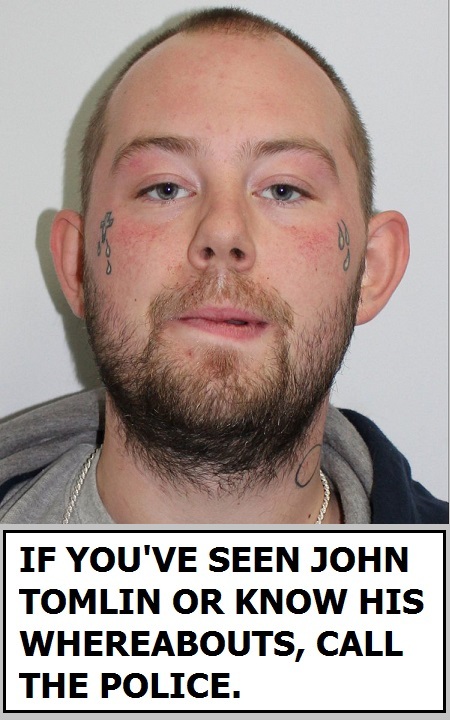 The suspect in this attack against random innocent people is a man called John Tomlin who is about 6ft tall and has distinctive crying tattoos on his face. The police have warned that members of the public should not approach him, and call 999 if they see him or know his whereabouts. A look at Tomlin's Facebook profile reveals that he has a history of sharing content from extreme-right hate groups like the Britain First spin-off "English and Proud". 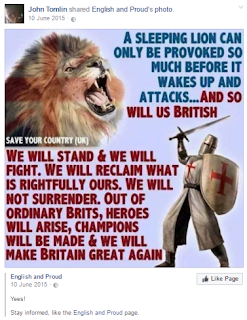 This is far from the first example of someone having been radicalised by extreme-right Facebook hate groups going on to commit acts of sickening violence. 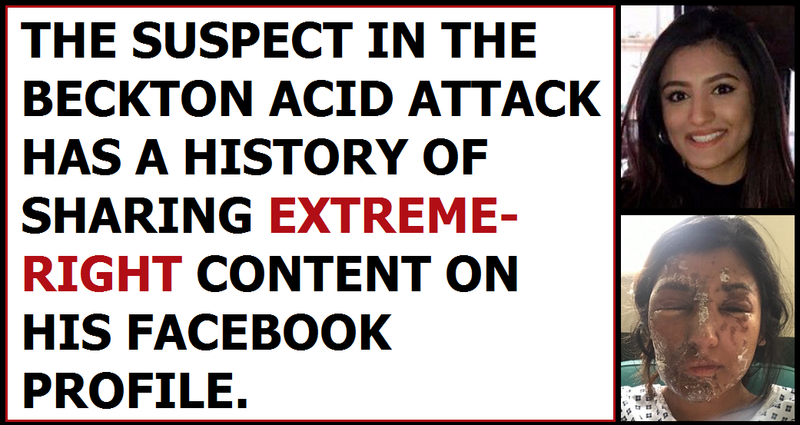 The extreme-right terrorist who murdered the MP Jo Cox was photographed at a Britain First demonstration (a picture that was reported to the police and to the mainstream media, but no action was taken); the suspect in the Finsbury Park terrorist attack followed the Britain First leaders on Twitter; and now the Beckton acid attack suspect has a history of sharing extreme-right Facebook propaganda too. Of course extreme-right sympathisers will try to argue the case that Tommy Mair, Darren Osborne and John Tomlin are all mentally ill and not representative of the wider extreme-right. The extreme-right "they're mentally ill - we're patriots" excuse is pathetic enough in it's own right, but coming from people who generalise about all Muslims based on the actions of a tiny violent minority, the hypocrisy is absolutely searing. Just imagine the mentality of the kind of person whose first instinct is not to condemn this kind of savagery, but to make excuses for it. Even if Tommy Mair and the two recent extreme-right terrorism suspects are all mentally ill, the extreme-right hate groups and their supporters who spread their propaganda all over social media are still clearly responsible because individuals resorting to acts of violence becomes inevitable when hundreds of thousands of people are subjected with daily bombardments of anti-Muslim propaganda, white supremacist ideology, and the kind of lawless lynch mob mentality that Britain First actively promote. Tomlin shared on his Facebook profile. Just look at the image that Tomlin shared. It's an absolutely clear incitement to, and glorification of violence. And just look at the absolute hero worship of people who carry out extreme-right atrocities that goes on in these extreme-right hate groups. Of course the mainstream media, the government, the legal authorities, and Facebook will continue to ignore the links between extreme-right hate groups like Britain First and their spin-offs, because if a Britain First supporter yelling "Britain First" as he shot and stabbed an MP to death in the street wasn't enough for action to be taken against extreme-right social media hate-mongering, then clearly nothing ever will be. We'll just have to witness a continuing succession of sickening atrocities committed by people who have been radicalised by extreme-right social media hate groups. We'll have to continue to witness these extreme-right attacks with the full knowledge that Facebook won't do anything about it because hosting extreme-right hate groups full of violations of their so-called community standards is a lucrative money-spinner for them, and that the government won't do anything because they have a much more tolerant attitude towards extreme-right hate preaching and its consequences than they do towards Islamist hate preaching and its consequences. During the 2017 General Election campaign the Tory party thought that they could simply buy social media popularity by pumping £millions into an unprecedented campaign of social media dark ads. The strategy backfired spectacularly because the Tories just didn't understand that you can't buy social media virality, you have to produce content that people want to share (something I'm apparently quite good at having written the #1. #2, and #7 most viral articles of the entire 2017 General Election campaign). The Tories got absolutely trounced on social media, and now that they know they can't buy social media success, they're expressing hatred and contempt for it. The Tory MP for South East Cornwall Sheryll Murray (the one who went viral when she was caught on camera saying that she thinks food bank Britain is a good thing) has been calling for a crackdown on social media free speech, and the Tory MP for South West Devon Gary Streeter has said that he hates social media "because it gives voices to people who don't deserve one". The idea that some people don't deserve a political voice is exactly the kind of digracefully elitist Tory rubbish that has alienated millions of younger people, and made the Tory party so damned unpopular on social media. The idea that there is a kind of special establishment elite who deserve to have their political opinions heard, and the rest of us are political untermenschen who deserve no political voice might well appeal to bitter old right-wing authoritarians who want to be dominated and repressed by a powerful political elite, but it's absolutely toxic to anyone with liberal social values or even the slightest amount of self-respect. The last three decades has seen a dramatic reversal in social mobility, with higher percentages of privately educated elitists in front bench politics and in the mainstream media than back in the 1980s, but social media is levelling the playing field a little by allowing state educated people from ordinary backgrounds (like me) the opportunity to express our political opinions. 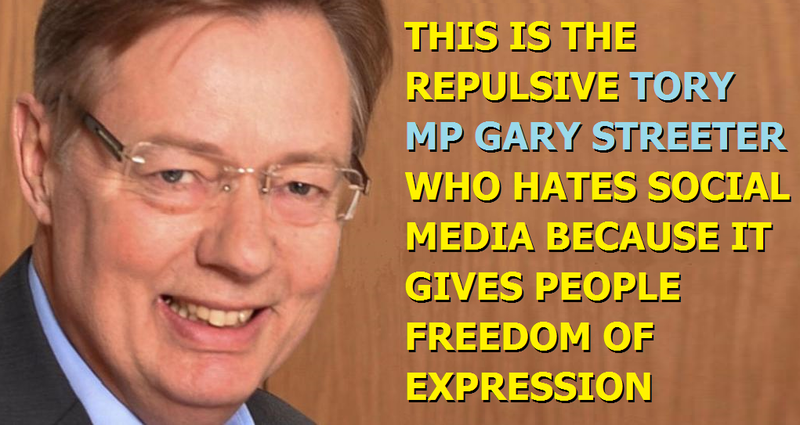 The Tories hate the freedom of political ideas that social media and the Internet allow, and that's why they're so damned keen to censor it. The idea of uppity plebs having political ideas of their own, rather than rote learning and mindlessly regurgitating the propaganda they're fed by the political establishment makes them sick with fear. Thankfully the scale of the social media fightback meant that Theresa May threw away her parliamentary majority in her vanity election, so now she's going to have a hell of a fight on her hands (inside and outside of parliament) if she's going to try to impose self-serving Tory censorship on social media and the Internet. Tory politicians know that social media played a vital role in stopping them from winning the super-majority they were expecting when Theresa May called her vanity election in April 2017, and they're now determined to crack down on it. 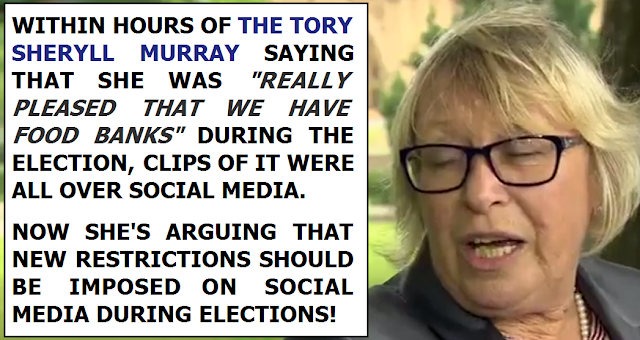 One of the keenest supporters of a social media crackdown is the Tory MP for South East Cornwall Sheryll Murray, who wants to see new restrictions on political commentary introduced on social media during elections. It's hardly surprising that Sheryll wants to see a social media clampdown on freedom of speech after a clip of her provoking outrage at a hustings by saying that she was "really pleased that we have food banks" went absolutely viral in the hours after she said it. The clip I posted on Facebook was seen 1.5 million times, and I was obviously far from the only person to upload it on social media. Sheryll knows that in the olden days of carefully managed media presentation of the news most people would never have heard of a Tory hustings gaffe like hers or her appalling attitude towards her critics, but now that ordinary people have a measure of control over what is newsworthy (shareable) her out-of-touch gaffe has been seen by millions, and she's absolutely terrified. Sheryll doesn't like ordinary people to have the ability to hold elitists like her to account for their words and actions, so she's reacting like all right-wing authoritarians do when challenged, and calling for censorship because she's terrified of people power. One of the most interesting things about her call for restrictions on social media is the fact that of all of the political parties it was her Conservatives who were the worst offenders, spending £millions to spew their smears and outright lies into people's Facebook feeds, Youtube videos and even their Google search results. This unprecedented Tory campaign of dark ads was particularly bad because they refused to provide copies of their adverts to the electoral authorities. It just goes to show what a pack of absolute hypocrites the Tories are that they just spent £millions pushing the most extreme social media smear campaign in UK general election history, but because it failed and people chose to share genuinely viral content rather than Tory smear jobs, they suddenly want impose a clamp down on social media free speech. The Tories are so terrified that ordinary people were sharing "the wrong content" that they want to censor what we can say and share on social media. Over the last few months countless Tory MPs have repeatedly praised emergency service workers. After the Westminster attack; after the Manchester Arena atrocity; after London bridge; and after the inferno at Grenfell tower. But then when they had the opportunity to end the seven year long campaign of wage repression against public sector workers they voted it down, and then actually cheered themselves for doing it. The opposition parties gave all of these Tory and DUP politicians the opportunity to rebel against Theresa May's malicious and economically ruinous austerity agenda and end the repression of public sector wages, but they all refused the chance, and then had the absolute gall to cheer themselves for voting to continue impoverishing our emergency service workers. 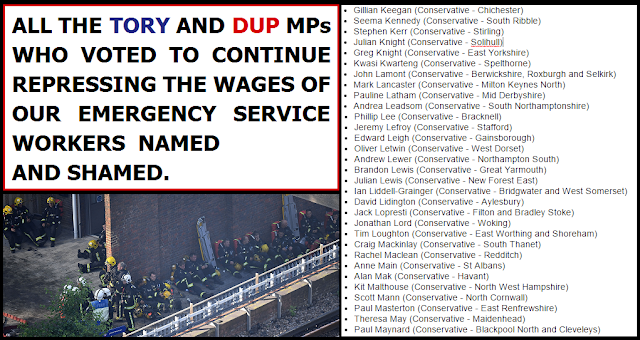 So from now on if you ever hear any of these politicians talking about how much they value our emergency service workers, you know for sure that they don't actually care at all, and that they're just lying through their teeth to convince intensely gullible people into supporting their malicious hard-right coalition of chaos. Are you an economic traitor? Excuse me, who is the communist sympathiser?